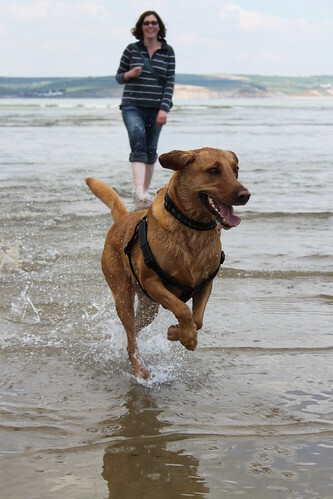 A couple of weeks ago, Natalie, Molly and I headed out to Weymouth for a day at the seaside. 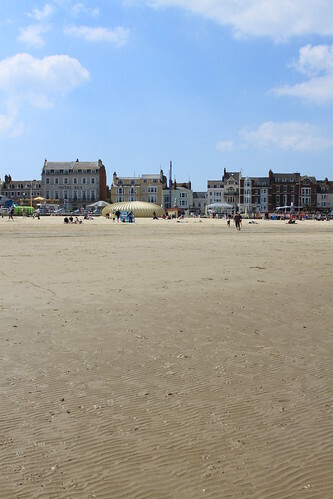 In case you’ve never been there, Weymouth is a medium sized town on the Dorset coast, now famous for having hosted the sailing events for the 2012 Olympic games. 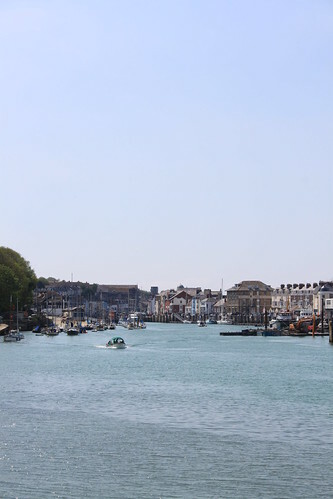 I spent several of my childhood years growing up in Dorset, so feel a close connection to the area. And here’s some more. 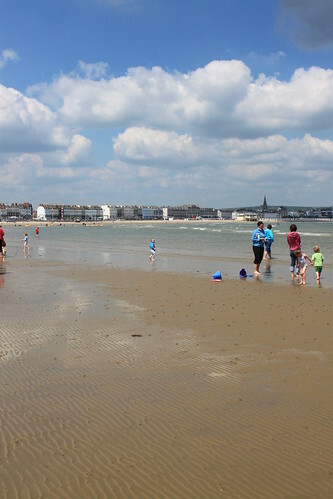 As you can see, it’s a pretty family-friendly place, with the gentle slope of the beach making it ideal for adults and kids alike to play around in the water. At the southern end of the beach, there’s an area where dogs are allowed, too. So this is where we inevitably ended up. 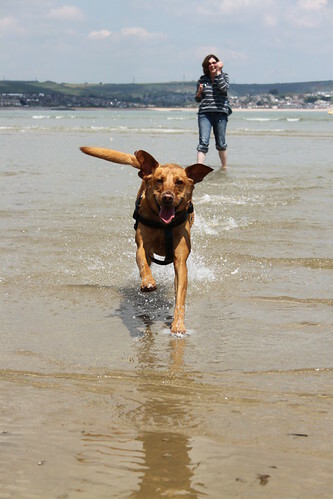 In fact, Molly had seen the other dogs from about a mile away and had dragged us there at top speed. 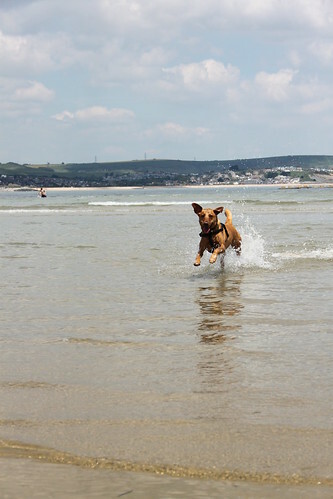 She’s not always a big fan of the water (I think she’s put off by the breaking waves), but today was an exception. But she seemed to be enjoying herself. So did Natalie. And so, for that matter, did everyone else. Including me. 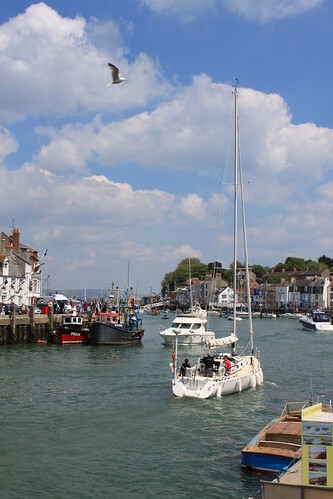 Weymouth also has a very picturesque and incredibly busy harbour, with a good mix of working and pleasure craft. Here’s what greets you as you come in from the sea. Just the thing after a hard day’s sailing. 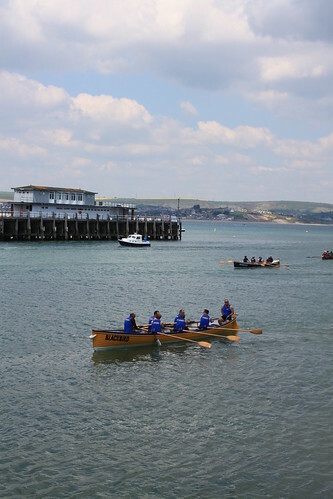 As we walked along the southern side of the harbour towards the sea, we came across some gig rowers taking part in a regatta. 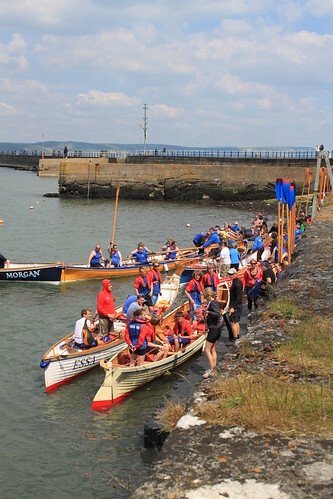 As coincidence would have it, this is a team from the Clevedon Pilot Gig Club, which I have recently joined. I don’t know how the team did in the race, so we’ll assume here that they absolutely destroyed the competition and won by several boat lengths. And as we walked further, we came across a veritable nest of boats as they changed crews for the next race. Having now been gig rowing twice, I can confirm that it is, indeed, as much fun as it looks. Possibly even more fun, in fact. We stopped for a little while to watch the rowers. Molly, for one, was enthralled. 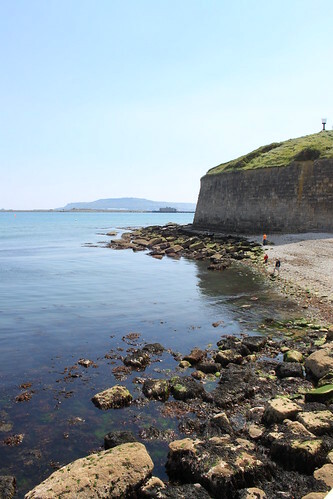 At the entrance to the harbour is the imposing Nothe Fort, a massive fortified structure built in the 1860s and designed to protect nearby Portland Harbour. 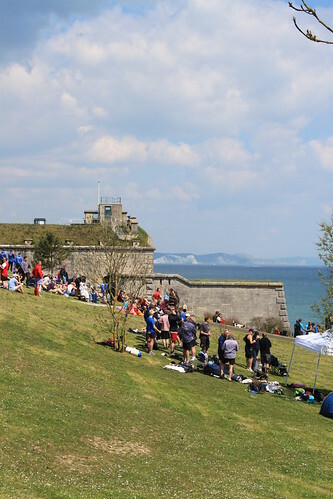 It’s now a popular tourist attraction as well as a reminder of the role that Weymouth and Portland played up until very recently as a major naval port. 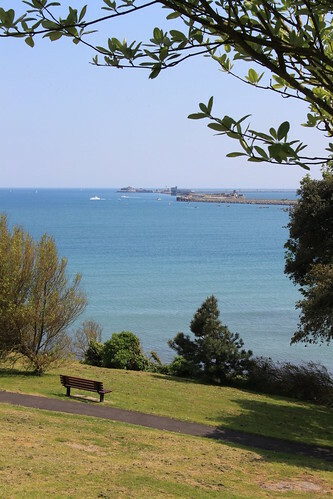 The views from the area around the fort are fantastic. You can see why this part of the world is so popular with watersports enthusiasts and why the National Sailing Academy is based here. 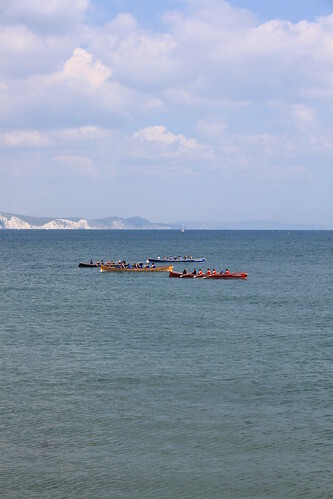 We also stumbled across the rest of the gig racers, taking a break while their team mates took their turn at the oars. There was an incredibly sociable atmosphere, with people from the various teams sharing war stories over a beer and a barbecue. This, it struck me, is what sport is all about. Molly had the same idea, so I dragged her swiftly away from the barbecue and we continued on our way. 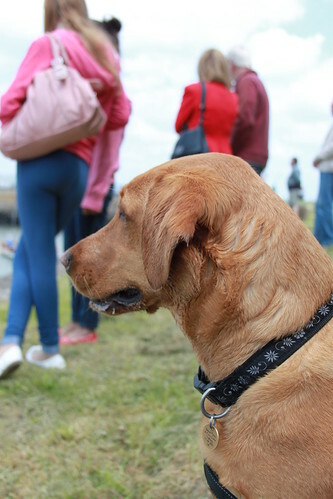 This entry was posted in Dogs, Family, Photography, Travel and tagged Coast, Dorset, Family, Gig racing, Photography, Sea, Travel, Weymouth by Simon Perks. Bookmark the permalink.